During the AESOP conference in Aveiro, 1998, a small group of scholars in the field of planning, law and property rights met and discussed their wishes on a Planning and Law track at AESOP. PLPR’s founding president, Rachelle Alterman (Technion, Israel), together with Willem Salet (University of Amsterdam), Ben Davy (TU Dortmund) organized the first track during the AESOP conference in Bergen, 1999, around barely a handful of papers and a small audience. Since Bergen, the PLPR track grew and evolved during every annual AESOP conference and in meetings during congresses of any other association of planning schools. The group matured and evolved. During the 2006 World Congress of Planning Schools in Mexico City, a group of interested faculty members from many countries convened and decided that they would like to establish an International Association on Planning, Law, and Property Rights. This Association was established during the inaugural symposium in Amsterdam, in 2007, with Rachelle Alterman as first PLPR President. Subsequent meetings took place in various places all over in Europe but also in other parts of the world. PLPR meets current needs. Currently, PLPR is a free-standing standing academic association with over 400 individual members, from all continents, its own statutes and a website. The continuous increasing number of participants demonstrates the extent to which PLPR meets a range of growing needs in the field of planning, law, and property rights. Given the level of enthusiasm amongst its members, it is to be expected that the group will grow and mature even further over the next decades. 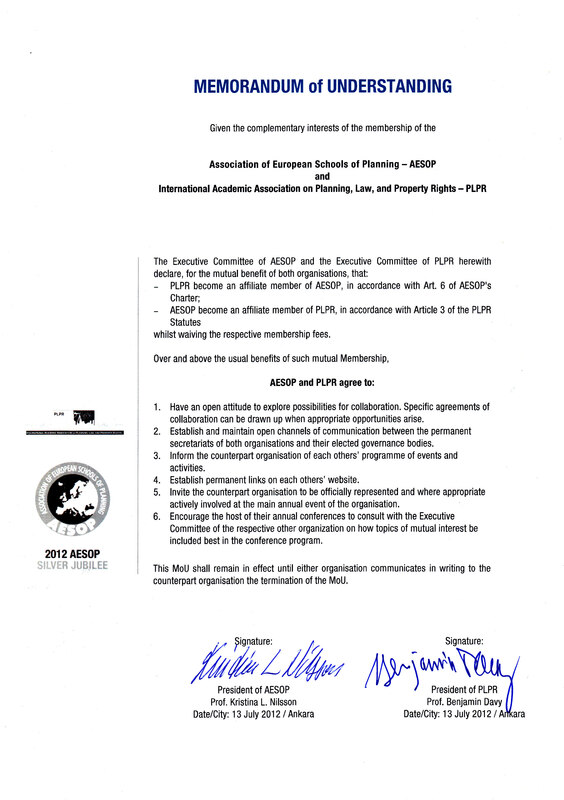 In 2012, Prof. Ben Davy, president of PLPR, and Prof. Kristina Nilsson, president of the Association of European Schools of Planning (AESOP) at the time signed a Memorandum of Understanding. This memorandum affirms and institutionlizes the mutual friendship between the two associations. Linda McElduff and Rachelle Alterman coordinate the thematic group on Planning, Law, and Property Rights within AESOP. Please visit www.aesop-planning.eu/blogs/en_GB/planning-law-and-property-rights for further information. The International Academic Association on Planning, Law, and Property Rights will cooperate with the Association for Law, Property & Society (ALPS). 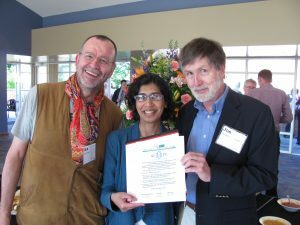 Former PLPR President Ben Davy, the outgoing ALPS president Rashmi Dyal-Chand and the incoming ALPS president Jim Smith signed a Letter of Understanding at the 2015 ALPS conference in Athens.